In the 19th Century chemical dyes were introduced that revolutionised the textile industry, for example William Perkin discovered anililne purple or mauveine in 1856. Because clothes were so expensive to buy new during the Victorian era, dyeing was a way of rejuvenating old and worn clothing. It was especially useful when dark stains could not be removed from clothes that were still wearable. 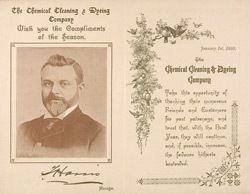 Cleaning and dyeing processes were usually carried out on the same premises during the 19th century as can be seen from the name of the company featured on this leaflet.